Demonstrating that scrap can be beautiful, Giveacar has announced the winner of its first ever photography competition, which was open to photography fans worldwide. The Giveacar competition, “Scrap is Beautiful”, called for images of vehicles past their best, which could be scrapped and the proceeds donated to charity. From old military units to rusty old cars, the pictures of scrap-worthy vehicles received were varied and creative. Stephen Elliott, of Hope Valley, Derbyshire, was chosen as the overall winner of this online competition. 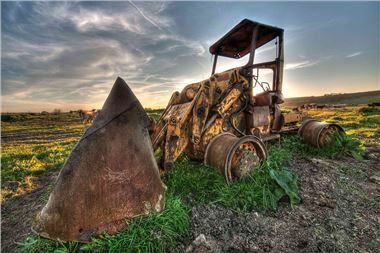 He took the stunning image of an old loading shovel that had been rusting away for years in a farmer’s field just outside the village of Eyam, in the Peak District, Derbyshire. Judges voted the atmospheric photo No 1 out of the hundreds of entries received by Giveacar. Giveacar is the first organisation in Britain to offer drivers a hassle-free way of getting rid of their old cars and making a donation to the charity of their choice. The not-for-profit social enterprise picks up the vehicles and then uses eco-friendly recycling facilities to break them down into raw materials, which are then sold on. Cars worth more than their scrap value are sold at auction. Car owners are able to choose which of the UK’s 200,000 charities they want the money to go to. Stephen Elliott will be donating his £500 prize to his charity of choice, The Yorkshire Air Ambulance, which has previously received donations totalling over £1,000 from Giveacar.